Saturday morning and the Battle of Valmy began. Steve reprised his role as Dumouriez while Shaun was Kellerman. 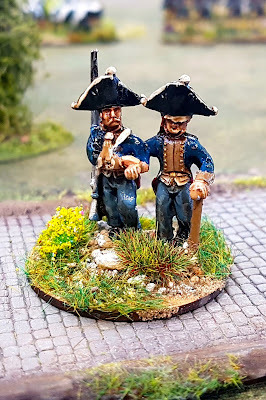 Conrad and Paul changed their white uniforms to blue to become the Prussian commanders. Paul was Brunswick and Conrad was Hohenlohe. 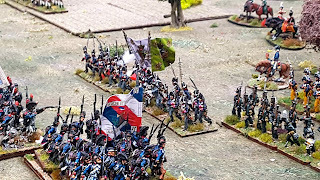 Unlike in the real action the Prussians would not be retiring after a brief 'cannonade', and with the French firmly across their lines of communication would certainly be attacking. 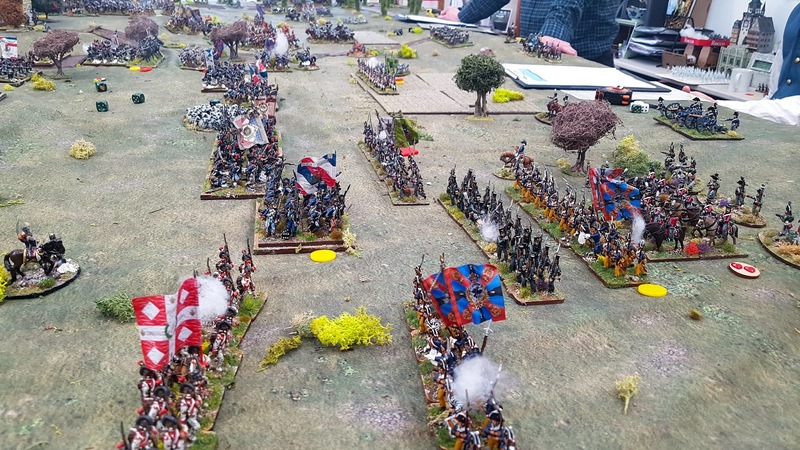 The French didn't really need to attack but elected to advance on their right to try and tempt the Prussians forward (not that they needed any tempting) while the centre would hold. Their extreme left was supposed to advance, but that didn't happen. Without further ado, what follows are rather a lot of photos showing how the game developed. Hopefully the captions will give an indication of how it all played out. 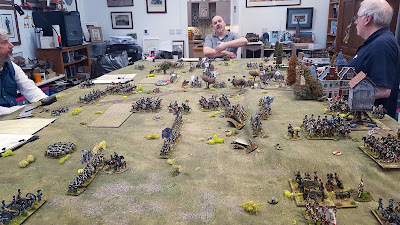 Turn one and Steve pushed his horse artillery forward supported by two small cavalry regiments. Conrad's response in his turn was to charge the guns and the hussars in the foreground. The Prussian hussars survived closing fire from the artillery and rode the battery down. 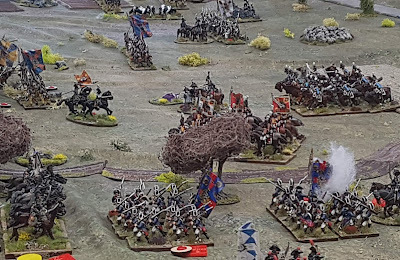 Shaken in the process the hussars withdrew. 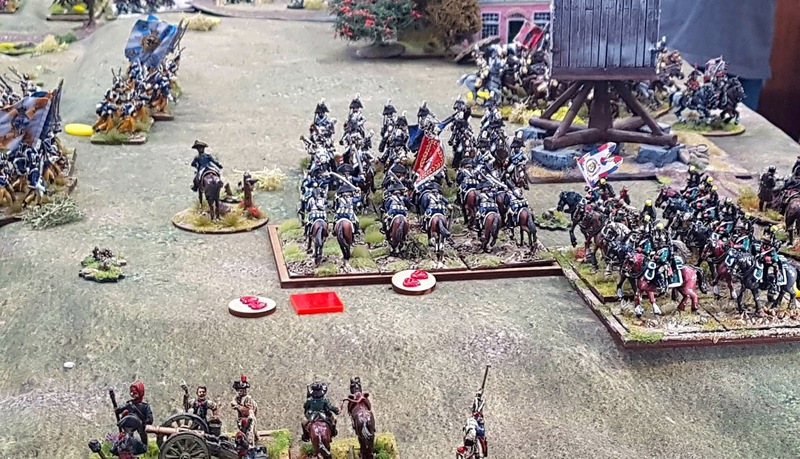 Conrad's dragoons were driven back by the French hussars but the victory would short lived as the Prussians turned their artillery on the hussars, breaking them. Conrad's main infantry command advanced rapidly across the table, thanks to a blunder requiring them to make three moves! A close up of GL von Schönfeld's division negotiating the sheep. The steaming dung heap represents a blundered command. I must get some limbers or dual task my Prussian SYW ones next time. 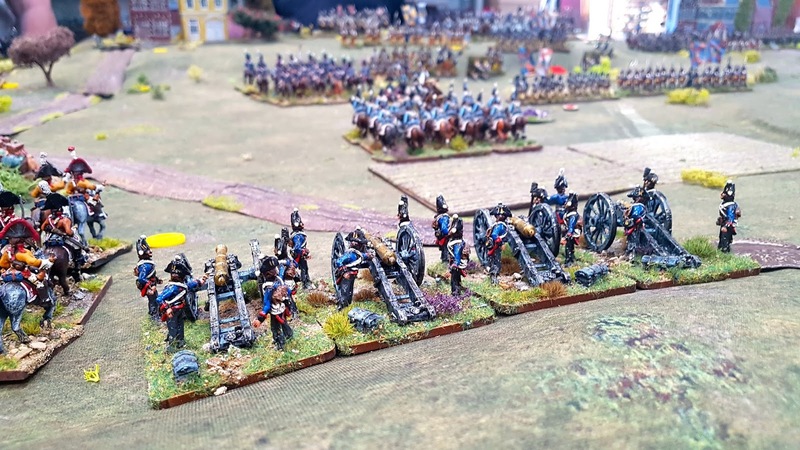 Prussian horse(less) artillery advances. Steve tried to order a charge on them with his heavy cavalry regiment while they were limbered up but failed to throw low enough. Kellerman's Armée de Centre on the hill south of Valmy. Shaun's dice throwing started bad, got worse, and stayed dreadful for the entire game. On the left his grenadiers out distanced his chasseurs while his cavalry advanced to try and tempt a cautious Paul forward. Back on the right with Dumouriez Steve ordered Miranda's cavalry to belt forward and try to force the Prussians into square and halt their advance. Dumouriez's remaining cavalry likewise charged and forced a battalion of fusiliers into square. The French cavalry was unlikely to make much impression on the Prussians other than to force them into square and thus slow down the advance. 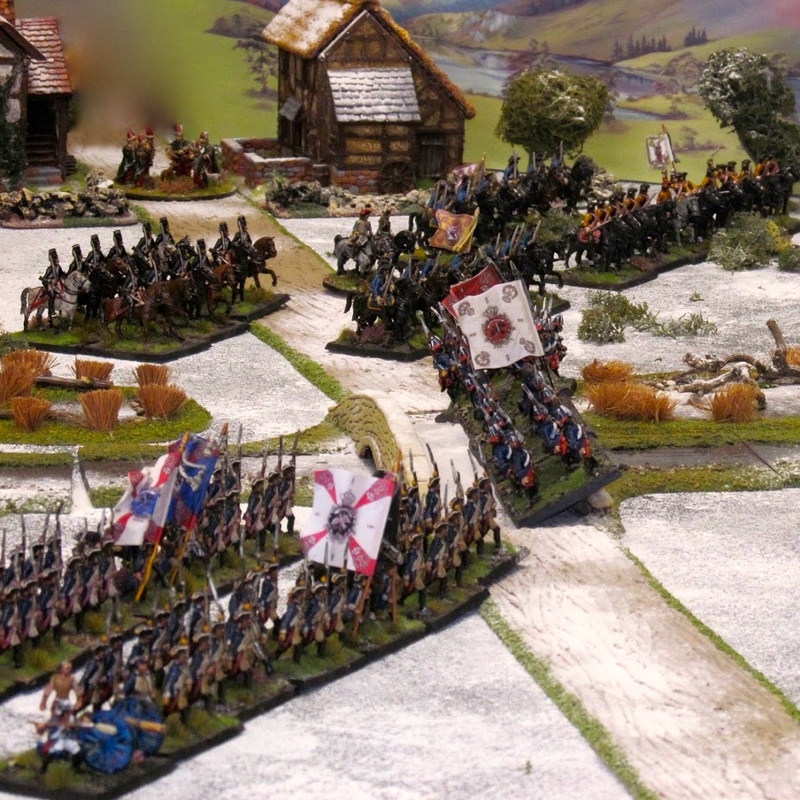 Steve then ordered his regular battalions to charge the Prussians. All did not go to plan. Although they destroyed one battalion together with its support, both of the French regular battalions failed break tests and fled. Thankfully for the French the Prussians were unable to take advantage of this due to the presence of three (albeit small) regiments of French cavalry. Paul's command included a brigade (Division!) 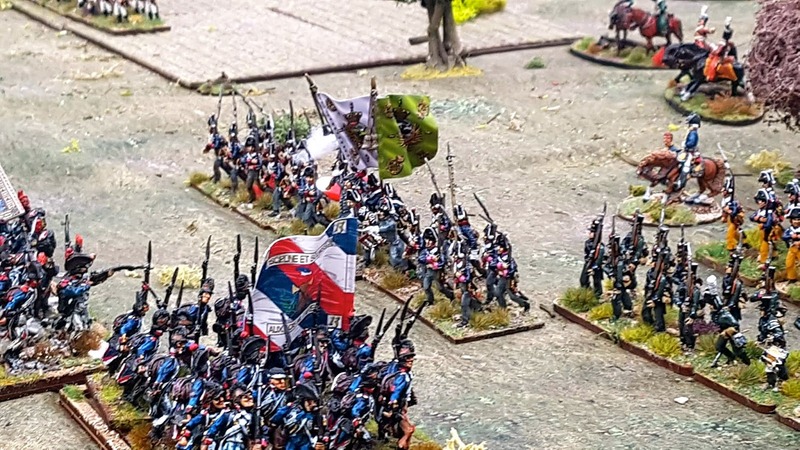 of eight infantry battalions and two heavy batteries. The infantry made a slow start. Paul is seen here checking when he can expect his cavalry brigade held off table in reserve to make an appearance. And here the are. Five large regiments of cuirassiers and dragoons. I think I was being over generous in making these large units as it was going to make them pretty unstoppable. Or so we thought. Another shot of the cavalry as they appear over the crest of the hill. Back on the other flank Conrad's attack had been halted by the presence of cavalry and the advance of several battalions of very eager volunteers. The latter were class as untested and newly raised in the rules, i.e. they had randomly generated stamina and could react very well or very badly to their first taste of combat. Steve kept throwing 6's so several his volunteer battalions had a stamina of 4! Shaun looking slightly awestruck as the Prussian horsemen head right for his part of the line. 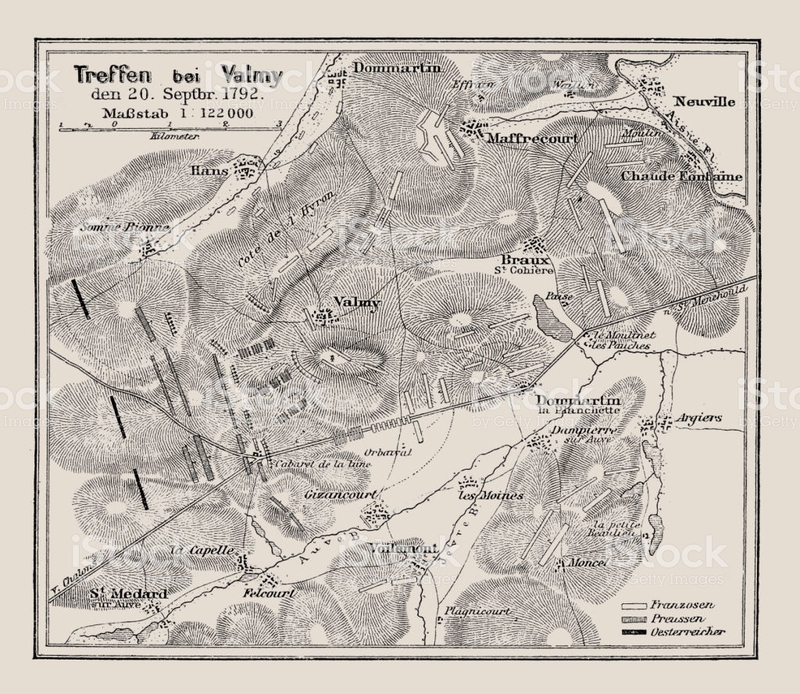 The thinly held hilltop south of Valmy. At least most of the French regulars were posted here. The Prussian cavalry again. Sorry, but I just love these regiments. Not all the figures are on the table as the regiment are actually organised into five squadrons of six figures each. Still an impressive sight and you could almost feel the table vibrate in reaction to the hammering of horses' hooves! Maybe this was where Napoleon got his inspiration for massed cavalry at Eylau 15 years later? CR No 12 about to charge. Paul elected to charge Shaun's horse artillery. The battery could have evaded but chose to stand. They did well, causing 3 hits before they were overrun. 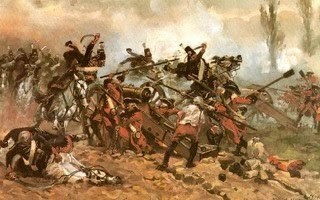 Previous casualties from artillery fire on the Prussian cuirassiers meant that this regiment was close to becoming shaken. Another cuirassier regiment poised to attack the French dragoons seen at the bottom of the picture. Paul then threw in his infantry. The very confused melee atop Valmy Hill. 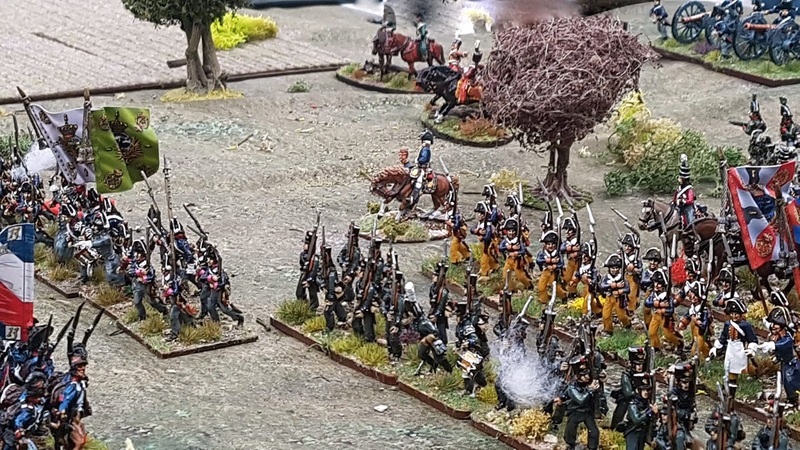 CR No 12 charged the French dragoons, forcing them back. In doing so they became shaken had had to retire to rally. The lines are thinning out as the fighting takes its toll on both sides. 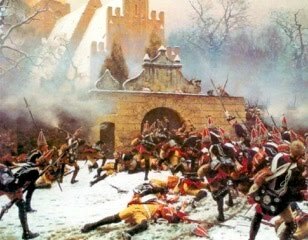 The Prussians were throwing troops into combat as if they had unlimited reserves. 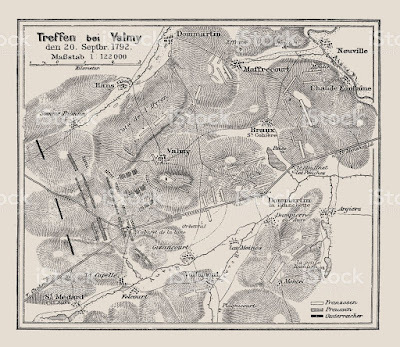 Several battalions were broken or shaken but the French too were taking heavy losses, especially among their regular battalions. Meanwhile, Steve was pressing home his counter attack. One of Conrad's brigades was in full retreat and now it was time to deal with the other. That was then plan at any rate. The southern end of the battlefield was positively serene by comparison to the rest as neither side wanted or was able to close with the other. 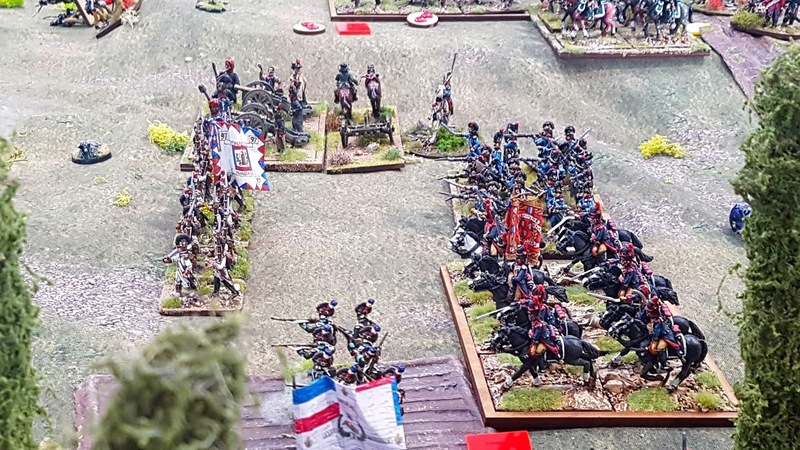 Paul's cuirassiers driving a large wedge into the centre of the French line. The battlefield seen from the north. 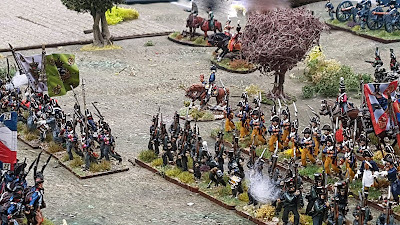 Steve's reserves arrived in the nick of time, but their advance was foiled by an audacious charge by Paul's dragoons that forced the French horse artillery that HAD been limbered up to the left of the green-faced regulars to evade back off the table. The Prussians then hit an already engaged French regular regiment in the flank, rolling them up. The victorious cuirassiers charged the French artillery in the flank making a sweeping advance. No surprise that they rode the gunners down. The French centre was now in all sorts of s**t! A further regular battalion, then another collapsed. 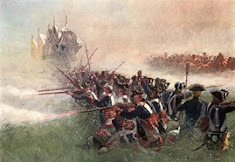 All was not up for the French as their right wing under Dumouriez (Steve) had blunted the Prussian attack. 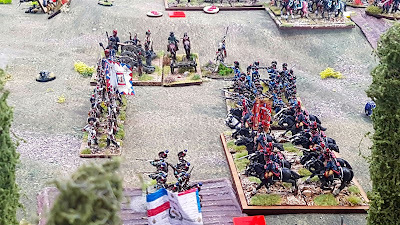 The French advance was helped by the fact that Conrad's last remaining cavalry had beaten and pursued a French regiment off the table at a critical point in time. Supported by a lone regular battalion the volunteers surged forward. The target of the French surging. Two Prussian battalions were pinned in square when the rest of their brigade became spent. The battle in the centre continued without respite. 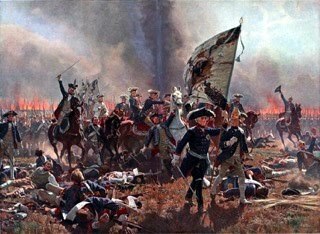 The Prussians still had two uncommitted regiments of cavalry. The French threw in one of their last remaining cavalry regiments, led by the 8th regiment. 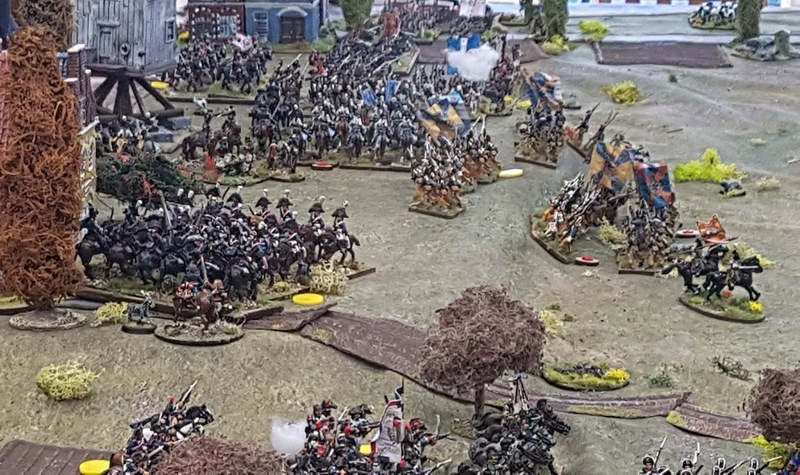 In the melee they managed to take the Prussians to 'shaken'. 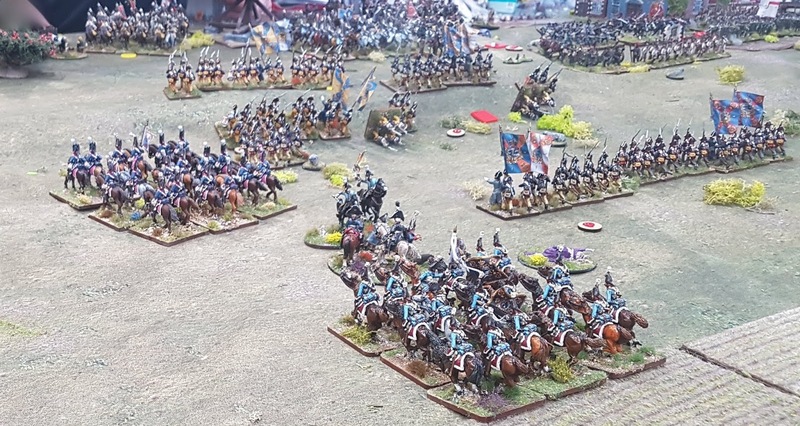 A quick count up showed that the cavalry brigade had run out of steam as the majority of units were also shaken. The French heaved a sigh of relief. On the French left nothing was moving, as had been the case for the entire game. The Prussian reserve artillery. They took the edge off a few French units early in the game. The Prussian right barely made it to the mid point of the table during the game. The end of the battle. 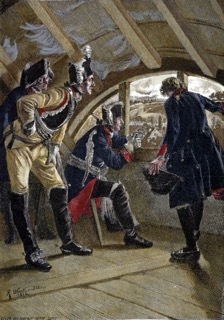 Three out of five Prussian brigades were shaken forcing the army to retire. The long road home to Berlin. Wow! What a dust up. I knew it was going to be a hell of a game before it started and I was not disappointed. The French had won a tactical and technical victory sorts but were so badly damaged that there was no way they'd be able to stop the Prussians withdrawing or marching round their flank to reconnect with their lines of communication. The Prussians had lots of shaken units as well as a few that broke and ran, but the French had the opposite, with a good dozen broken units, including six out of nine regular battalions and half their artillery. I must commend the guys for playing the period and not the rules throughout, in several instances refusing to perform 'gamey' moves as that would have been downright ungentlemanly. I thought the game flowed well, and everyone prefers the change to the turn sequence as it livens things up and adds yet another thing to think about when pushing your toys around the table. Black Powder still works for me in this period but I'd still like to go back to General d'Armée sometime, or try something new. Looking at the wreck of his army after the battle Brunswick may well have regretted his gut feeling earlier in the day that "We don't need to fight a battle here today". I'm sorry tired after wading through the AAR & all those pictures that I need a lie down. Didn't mean to tire you old chap. Looks like a corker of an action Colin. Sometimes the bad decisions that armchair generals like to criticize are so bad after all. I tend to think that Brunswick gets a bad rap in the FRW and 1806 campaigns, especially given how he was saddled with the King and advisors. Thanks Peter and very true. People forget he had a great record in the SYW. Another great AAR and one of those battles where you always wondered what would have happened if the attack has been pressed. In a sense now we know. Thanks Steve . It could have gone the other way right up to the last turn. Mail biting stuff. An excellent looking game but then we'd expect nothing less from you Colin. Well done. You must come up again for another game. Wonderful game Colin and despite my 3 wing formations failing to move it was great to play. I think the re-sequenced turn works very well. Thanks. Yes not getting your left wing to move was a bummer. I did manage to smash the large Prussian infantry formation and their very large cavalry attack so I mustn't grumble. Both formations were broken but so was my 3 unit brigade and the small light cavalry formation. But not a bad price to pay for the damage we inflicted.